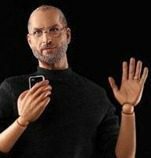 Steve Jobs, the action figure doll, is back in the news today. We first told you about the doll on Tuesday of last week. Standing at 12 inches tall, the images from the manufacturer are remarkably realistic. It looks like they’re using a photo, at least of the face, of Steve Jobs, rather than an image of a doll. The manufacturer does state that the actual doll may appear different than the prototype shown in their pictures. Below the realistic looking face, the action figure takes on more of a Pinocchio look. While most joints are covered by the tiny black turtleneck and blue jeans, the jointed wrists are clearly seen on this image. Today the Telegraph is reporting that Apple is threatening legal action against the doll’s creator, China based ‘In Icons’, whose website at www.inicons.com continues to promote the Steve Jobs doll. Apple claims ownership of Steve Jobs’ image, and according to the Telegraph, it considers any toy that resembles Steve Jobs’ image a criminal offense. The Telegraph also pointed out that the doll, which sells for $99 plus shipping through In Icons, was selling for $135 plus $28 shipping on eBay today. Twenty-nine were sold in that listing, according to eBay. As of this evening, another listing has the doll priced at $160, with free shipping. That listing indicates that 12 have been sold so far. If Apple plans to put the brakes on the sale of this doll, they be better move fast. It looks like the doll is already headed out the door.